Inst. c.1958 present location 3m., 10 rks. ext., el. pn. Enl. Frank Baldwin 2008 4m., 36rks.ext, el. pn. 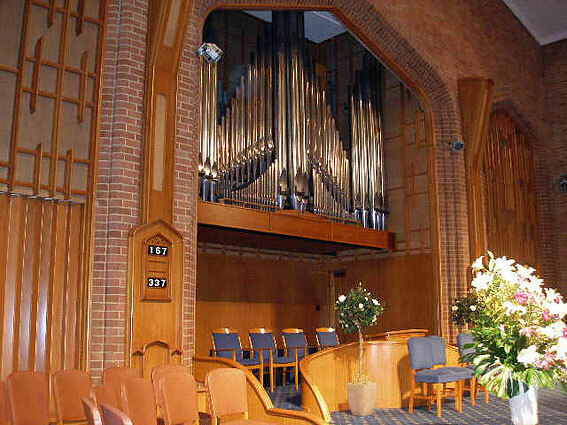 The basis of the pipe organ in the Seventh-day Adventist Church in Wahroonga is a Hill Norman & Beard Christie organ, built originally for the Konzerthaus Clou in Berlin, Germany. Appearing as Job No. 2698 in the HNB English Order Book, it was ordered on December 13, 1927 and was officially opened on June 14, 1928. The instrument was removed and returned to England after only a short time in this location. Rod Blackmore, a Theatre Organ Society of Australia member, notes that ‘One account suggests that it was then destined for the Civic theatre, Auckland, New Zealand’ . The organ was sent to Melbourne, but in 1929 the Civic bought a Wurlitzer. The Clou Christie was eventually installed in the Palatial Theatre, Burwood, Sydney, in 1932. Probably in 1956, while the current Wahroonga Seventh-day Adventist Church was being constructed, Franklin and Maurice Baldwin, together with Lyn Knight, spoke with Penn Hughes of Sydney, who owned the organ from the Empire Theatre in Dunedin and had it partially rebuilt in his house. Hughes wanted £4,400 for it. Before the church purchased it, however, he bought the Christie from the Palatial in Burwood and asked if the church would accept it instead of the Dunedin instrument. The church agreed. The Palatial Christie organ was three manuals and had ten extended ranks. At the time of the sale, Penn Hughes kept the wooden Tibias, and substituted for them the metal tibia rank from Dunedin. The origins of some other Christie pipes within the Wahroonga instrument are still being investigated, as some ranks are marked with different Job Numbers – the bottom octave of the Bassoon was originally destined for the Roxy theatre, Parramatta (Job No. 2777). 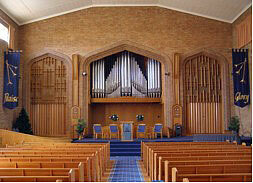 The Wahroonga church had been designed with no provision made for a pipe organ. However, two chambers on either side at the front of the church were able to be modified to house the Christie instrument. Ted Pitchford, organ builder and Sydney manager of Hill, Norman & Beard Ltd, was engaged to assist with its installation and tuning. 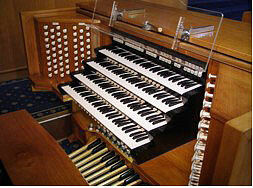 During the early 1980s the reliability of the organ became a real concern. The cotton-covered wires of the electric action had become brittle and increasingly faulty, and this, together with problems in the relays and frailty in the wiring loom, meant about half of the instrument was unusable. About this time some pipework was refurbished in Melbourne. 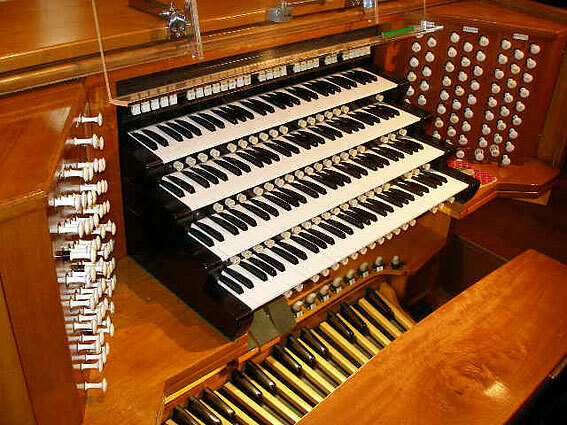 A decision was made to rebuild the organ and do away with the troublesome components, developing instead a computer-controlled instrument. As part of this project, Franklin designed and had a new console made by Charlie Ward, one of his employees. Geoff Batchelor, an electronics engineer, designed a pipe control system, had the circuit boards made, developed a wiring protocol and installed all the new cables – about 2,500 of them – to be connected to the pipes. Unfortunately, Geoff died in 1993 and the control system was developed no further until about 2001, when Dr Jon Duffy, Max Ward, Helen Smith and Geoff Hansen completed the wiring from the pipes to the driver boards over a period of 6 months. Colin Waters from Newcastle University spent a number of years developing the computer program but ultimately, with changes in computer technology, it became clear the original computer-based concept was not achievable in a reasonable time and was abandoned. In 2004 John Andrews was engaged to manufacture and install his own well-proven control system, which was not computer-based. Differences between the systems meant that much of the previous wiring had to be replaced. Geoff Hansen, who had been involved with the organ since about 2000, began the enormous task of rewiring the organ and the console, under the direction of John Andrews. The new four manual console was finally installed in the church in 2008 and now provides a reliable key action which is much faster than the old action. In the future, a capture system, also by John Andrews, will be built and installed. When St Mark’s, Darling Point, disposed of its pipe organ c1976, Franklin Baldwin purchased the pipework with a view to adding a Great Organ of approximately 800 pipes, to substantially increase the versatility of the Wahroonga instrument. This has been a project that has stretched over many years, and is still in progress. Franklin has constructed many of the windchests, but there are several more to be made and installed, along with their pipes. In addition to pipes from Darling Point, and some other anonymous pipework, Franklin ordered new façade pipes from George Stephens of Adelaide, who placed the order with Australian Pipe Organs, of Melbourne. In 2008, the steel framework and platform for the Great Organ division was constructed by Lance Weslake, from plans by Franklin Baldwin. It was then assembled and positioned on the floor at the front of the church, between the two existing chambers, by Geoff Hansen and Lance Weslake. After installing the windchests, the wind systems and placing in position all the large pipes, the whole Great Organ platform was winched up into position, where it now hangs from the roof via four heavy duty chains. 2008 also saw the fiftieth anniversary of the church building at Wahroonga and this provided further impetus to have the Great division operational for the celebrations on November 29. To enable this to happen, Mark Fisher was engaged to address the problem of many non-functioning pipes in the organ and to bring the whole organ together as an acceptable musical entity. He commenced, working with Geoff Hansen to ensure all pipes spoke reliably, then moved on to voice, regulate and tune all the pipework which had been installed on the Great. Finally, he regulated and tuned all the functioning ranks on the other divisions of the organ. The result is a Great manual containing rich, crisp diapason choruses, supplemented by mutations, a bright mixture and a strong Trumpet rank. It is an excellent division for leading congregational singing, as it provides clarity and substantial support. The swell division, in the right-hand chamber, contains Geigen Diapason, Tuba and Tibia units, a Vox Humana, and is prepared for further ranks. The Choir division, in the left-hand chamber, contains a small Diapason, Wald Flute, Strings, Horn and Clarinet/Bassoon units. The Solo manual features various solo ranks drawn from the other manuals. With former silent stops now speaking properly, and the addition of the new Great pipework, a much wider variety of tone colours enables an extensive range of music to be performed on this instrument, which still retains the characteristic warmth of tone associated with its roots as a Christie organ. Pedal Quint for 32' res. This article is based on information from Franklin and Maurice Baldwin, Geoff Batchelor, Geoff Hansen, Mark Fisher and John Andrews.